1882 Feb. 18, at 21 Catherine Street, Anderston, Glasgow. I don't know if this story about my Grandad is true as Uncle Roy was a terrible tease and may well have made it up! It's a fact that during the First World War conscription was not a big success in Scotland. Too many men failed their medical, probably as a result of childhood sub-nutrition. (I understand rickets was common in those days). So, according to Uncle Roy, when the authorities saw my Grandad, "a fine figure of a man" from the Isle of Islay, they promptly signed him up as a physical training instructor with the HLI (Highland Light Infantry). However, being of a "up and at 'em" temperament, the safety of this role did not suit him. So, if the story is true, my Grandad walked out of camp and enlisted with the Black Watch for a fighting chance of "doing his bit". Now, according to the story Uncle Roy told me, this resulted in my Grandad's name being posted on the list stuck to a pillar outside Govan Police station as a deserter from the HLI. On the other pillar outside the police station was a list of men from the district who had earned medals for bravery. 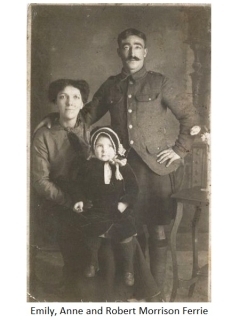 Grandad's name was on that list too as a brave Black Watch soldier. I know this story is true though as my Mum told it to me! I probably inherited my wanderlust from Grandad Ferrie. At one time he was working in Canada as a Lumberman, when he got into an argument with a French Canadian. It quickly grew physical and the other man leapt into the air and planted his hobnailed boot on my Grandad's face. This was why he later grew his magnificent moustache to hide the scars. Mum can remember her dad making her laugh as a little girl by exhaling his cigarette smoke into his moustache in such a way that it looked as if the smoke was coming out of his ears.